Probiotics: Streptococcus Thermophilus, L Bulgaricus, L acidophilus, Bifidobacterium Lactis, L casei. 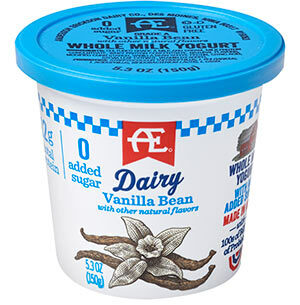 Our Whole Milk Yogurt With 0 Added Sugar is deliciously thick and creamy, with more protein, and no added sugar. Each 5.3 oz. serving provides high quality protein to keep you energized and full along with calcium, vitamin D, magnesium and potassium.